This week's episode is all about how amazing Fabric.. no Armor... no Fabric!! Wait? which is better? Are armor cosplays superior to fabric based ones? Or is it the other way around? The answer is in the episode. If you have ever found your self wondering this or even thinking that your cosplay method is the best, you might want to have a listen. It may surprise you to see how much work goes into each method and skill for these types of cosplays. Vermilion Fire vs. The Pannonator! 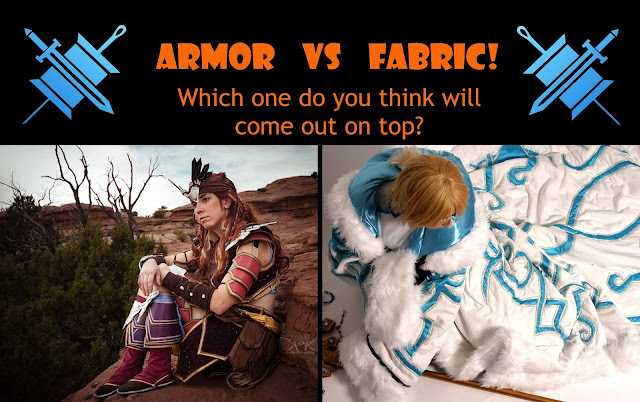 Make sure to stay tuned this week as VFire has some fun diagrams to share that help show how much armor and fabric type cosplay skills overlap. We hope you enjoy the episode and the fun things coming ahead. As requested, we have a Ko-fi Page now! If you like this episode or others, let us know in the comments, share an episode with a friend, or donate on ko-fi. We love all our listeners and appreciate the love and support we have received so far. Watch for news on goals and more! As always, thanks for reading and listening you amazing Stitchers and Seamers! Y'all rock no matter what kind of cosplay type you are.